Is Invisalign Treatment Right for Me? What Can I Do About Tooth Sensitivity? Do Clear Braces Work Well? What Can Dermal Fillers or Dysport Do for Me? You'll Hardly Know You Have Invisalign! Gum Disease and Tartar â€“ What Should I Know About It? What Are the Top 10 Symptoms of a Dental Problem? Most first-time root canal treatments achieve their purpose in saving an internally decayed tooth and extending its life to match those of the patient’s non-decayed teeth. 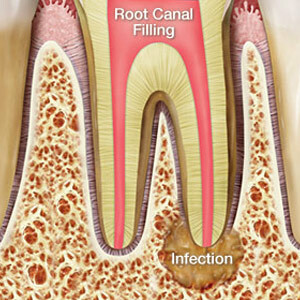 Occasionally, though, a root canal-treated tooth may become re-infected by decay. There are a number of reasons for this: the permanent crown meant to add further protection against decay may have been delayed, giving bacteria an opening to re-infect the tooth; it’s also possible the original seal for the pulp chamber and root canals after filling wasn’t sufficient to prevent bacterial contamination. There‘s also another reason that’s very difficult to foresee — the presence of narrow, curved root canals in the tooth that can pose complications during the procedure. Some of these known as accessory or lateral canals branch off the main canals to create a complex network that’s difficult to detect during the initial procedure. If they’re not cleaned out and filled during the procedure any tissue trapped in them can remain infected and ultimately die. If these canals also open into the periodontal membrane at the attachment between the teeth and bone, the infection can spread there and become a periodontal (gum) infection that can trigger future tooth loss. Fortunately, a reoccurrence of infection isn’t necessarily a death sentence for a tooth. A second root canal treatment can correct any problems encountered after the first treatment, especially complications from accessory canals. It may, though, require the advanced skills of an endodontist, a dental specialist in root canal problems. Endodontists use microscopic equipment to detect these smaller accessory canals, and then employ specialized techniques to fill and seal them. If you encounter pain or other signs of re-infection for a tooth previously treated with a root canal procedure, contact us as soon as possible. The sooner we can examine and diagnose the problem, the better your tooth’s chances of survival by undergoing a second root canal treatment.